Where do all the tourists go ……. Well, of course, they go home – eventually. But, first, they have to get here. And many of those tourists coming and going are doing so by rail. So, when they get home, how will they reflect on their trip to Rye ? MLAG has, again, looked at the difficulties tourists encounter getting to and from Rye. Last weekend we found the following (some numbers approximated; times are all at Rye). So, there were some very unhappy tourists. We don’t know if the Pride rally in Brighton had any effect on numbers – we wouldn’t have thought so, travelling via Rye is now (with the cutting of the service at Eastbourne) a train change too much. 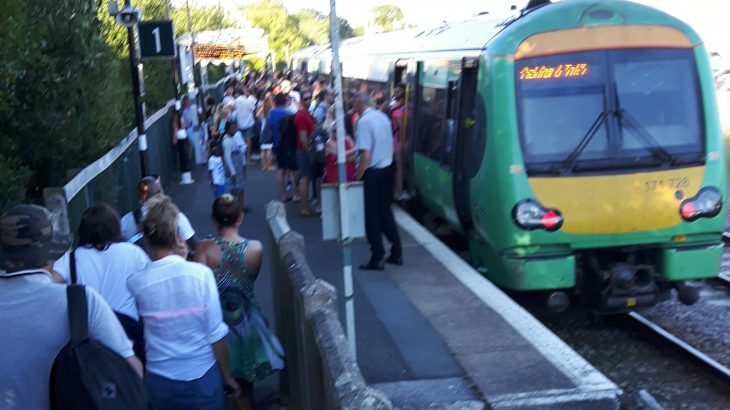 We don’t say the overcrowding at Rye is comparable with the problems at Brighton last weekend. But the Rye situation was bad and dangerous ! Events, Latest News, MLAG Press Statements, Slider. permalink.